Beautiful residence "LES ALPAGES DU CORBIER", 8 storeys, built in 2007. Below Corbier, 700 m from the centre, 50 m from the skiing area. For shared use: swimming pool angular heated (5 x 10 m, depth 150 cm, 20.12.-20.04. and 05.07.-30.08. pool opening hours: 10:30-19:00). Shower/WC in the pool area. In the complex: restaurant, bar, breakfast room, sauna (extra). 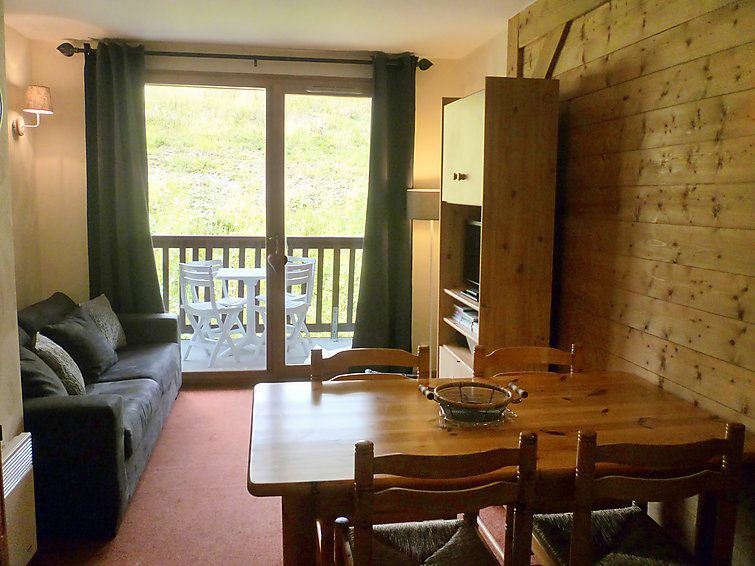 Fitness room, lift, storage room for skis, washing machine, tumble dryer (for shared use, extra). 50 m long steep, narrow motor access. In Winter: please take snow chains. Public parking 150 m. Shop 550 m, grocery 100 m, restaurant, bar 600 m, bus stop 700 m. Ski lift, chair lift, skisport facilities, slopes, ski bus stop 50 m, ski school 600 m, ski-kindergarten 300 m, sled run 600 m. Please note: In case of good snow conditions, the house is accessible on skis. 2-room apartment 32 m2 on 1st floor, south facing position. Living/dining room with 1 double sofabed, TV and DVD. 1 room with 1 x 1 bunk beds, 1 french bed. Kitchen (dishwasher, 4 ceramic glass hob hotplates, microwave, electric coffee machine, raclette grill). Bathroom, sep. WC. Balcony. Terrace furniture. Partial view of the ski run. Facilities: hair dryer. Internet (WiFi, extra). Please note: non-smokers only. Smoke alarm.